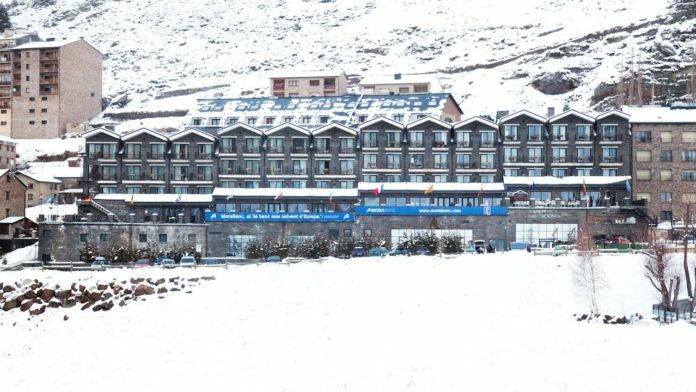 The Andorran ski resort town of Soldeu is in the heart of the Pyrenees mountains and Hotel Piolets Soldeu is one of the closest hotels to the ski lifts. The Andorran ski resort town of Soldeu is in the heart of the Pyrenees mountains and though it’s busy throughout the year, it’s during the winter months, when the snow lies thick on the ground, that it’s really buzzing. Hotel Piolets Soldeu is just metres from the gondola station, with many of the rooms overlooking the black run used for the Women’s World Cup. Hotel Piolets Soldeu is for serious skiers: it’s one of the closest hotels to the ski lifts, there’s a designated ski locker room in the basement, and all of the rooms at the back of the property overlook the slopes. 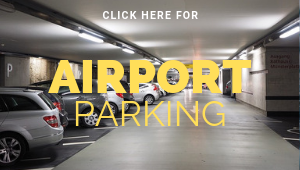 Families and groups are attracted by the option to have all your meals included, the heated indoor pool, and the fact that although there are lively bars and nightclubs nearby, the hotel itself is quiet, so you can get a good night’s sleep when you need to. The hotel’s rooms are spread across the upper floors of the building, either facing the slopes, or looking over Soldeu town. The slope-facing rooms have balconies, so you can make the most of the view. Inside, you’ll find comfortable double or twin beds, and plenty of space to hang and dry your ski gear should you need to. 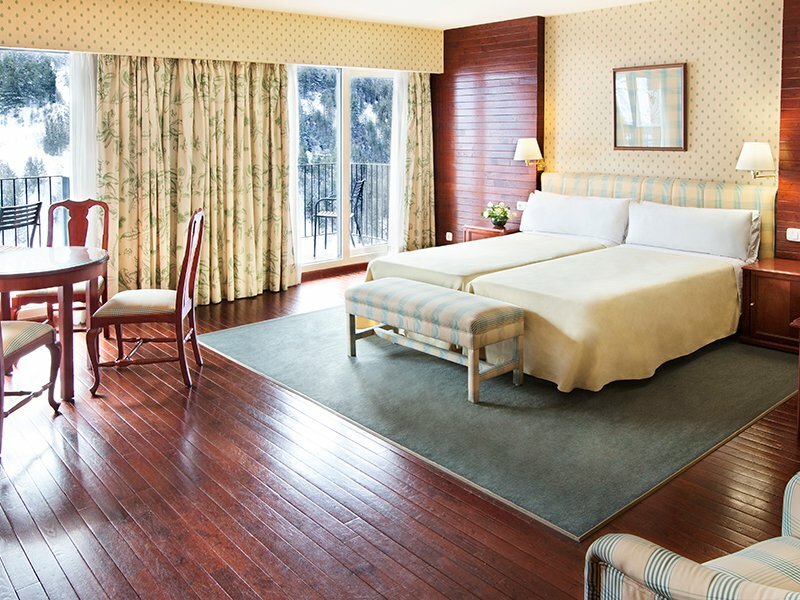 Many of the rooms can be interlinked, which is ideal if you’re travelling with children. The en suite bathrooms have hot showers and baths, which are a godsend to soak in and relax tired muscles at the end of a long, sometimes cold, day skiing. Rooms are accessible by elevators from the lobby, and a second elevator goes straight from the locker room to all floors. 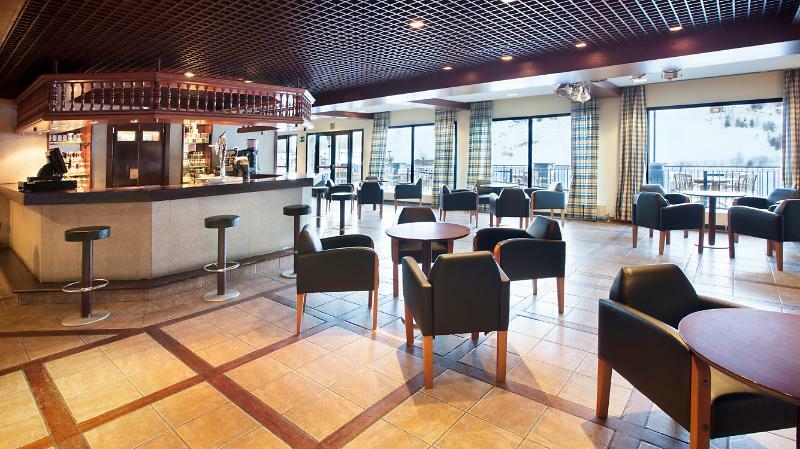 On the ground floor of the hotel you’ll find the bar (see below), which has a pool table should you fancy a game. 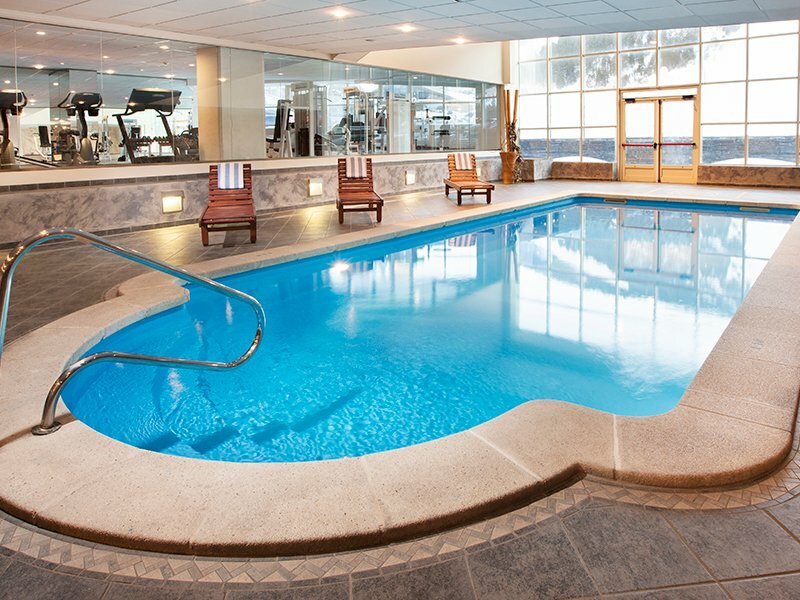 In the basement there’s a heated swimming pool, sauna and steam room, which guests can use for a small fee. You’ll need to bring or buy a swimming cap if you want to use the pool. Most guests at Hotel Piolets Soldeu opt for half- or full-board. 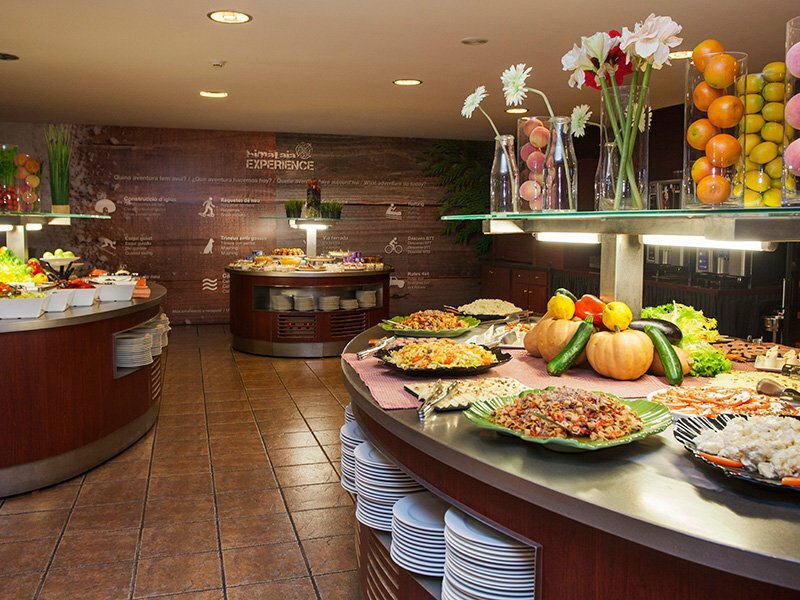 There’s a large buffet laid on for every meal, and though it does get busy, the staff do a sterling job of turning out fresh dishes. Given that they’re catering predominantly for skiers, it’s mostly calorie-laden, carb-heavy fare, but there are some tasty local Andorran and Catalan options, including fish dishes, and tapas-style snacks. Regardless of the time of day, you can also stop by the hotel’s bar. The coffees and hot chocolates are a warming treat, especially if you have a pastry or muffin at the same time, and it’s seemingly never too early for a pint of draft beer, a gin and tonic, or a cocktail. In Andorra, there’s no duty on alcohol, so you’ll stay smiling even when you get the bill. 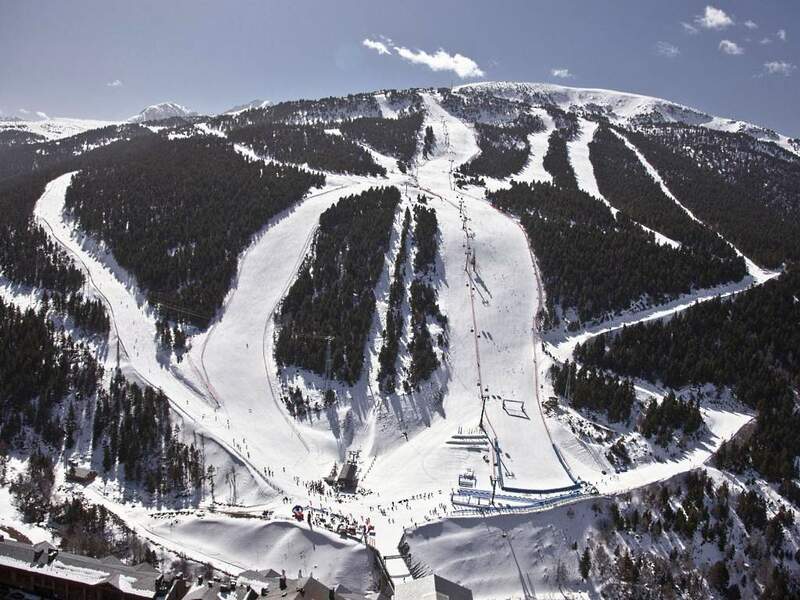 Soldeu is the best access point for the Grandvalira ski resort, the largest continuous ski area in southern Europe. The Soldeu ski school was set up, and is run by, Brits, and all of the ski and snowboard instructors are internationally qualified. If you don’t fancy skiing, you can try your hand at dog sledding, snowmobiling, and igloo building. There are some beautiful mountain walks (though snow shoes or cross country skis are advisable in the winter), and you can rent mountain bikes with thick snow tires too. Soldeu’s après ski scene is the liveliest in Andorra, and none of the nightlife spots are more than a couple of minutes’ walk away from Hotel Piolets Soldeu. The Harp, the most popular live music bar, is opposite the hotel, as is The Aspen sports bar, with its giant television screens, pool tables, and table football. If you have a day left after your ski trip in Soldeu, read more about what to do in 24 hours in Andorra in this article. 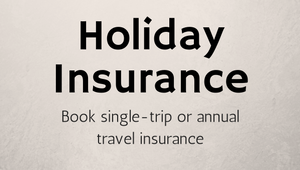 Andorra is one of the most affordable ski resorts in Europe, and significantly cheaper than those in the Alps. Hotel Piolets Soldeu is well-priced, especially given its central location. Andorra has no commercial airport, so you’ll need to take a flight to Barcelona or Toulouse. Onward bus transfers to Soldeu and other Andorran resort towns are frequent, especially in the ski season, and the bus stops right outside the hotel.